Full Description: One of a group of publicity cards, adverts and postcards of “George Young, Blind Musician”. 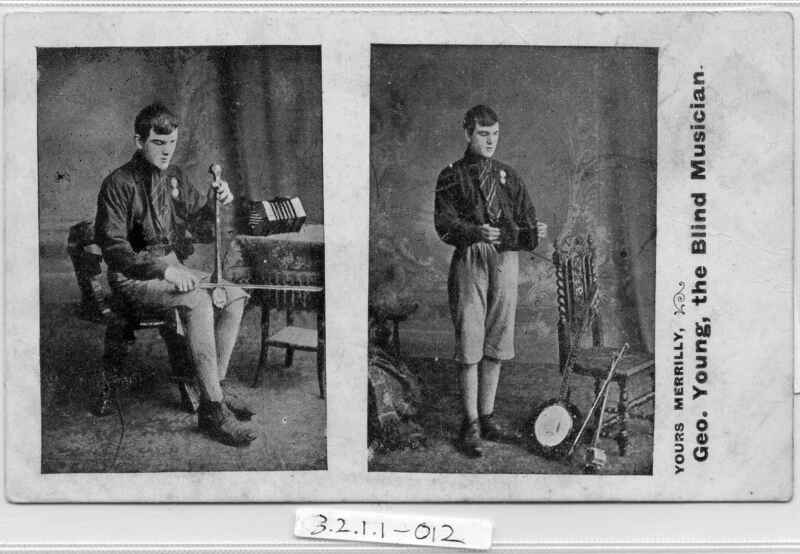 In this version, he poses in two half-sized pictures, one with a Samisen-style one-string fiddle with a 48-key metal-ended English concertina, with a 48-key metal-ended English concertina, the second playing the concertina, with one-string fiddle and banjo leaning on the same turned-legged chair that appears in all his other photographs. This item is postally divided to the rear. This one has the message “Yours Merrilly, (sic) George Young, The Blind Musician”.